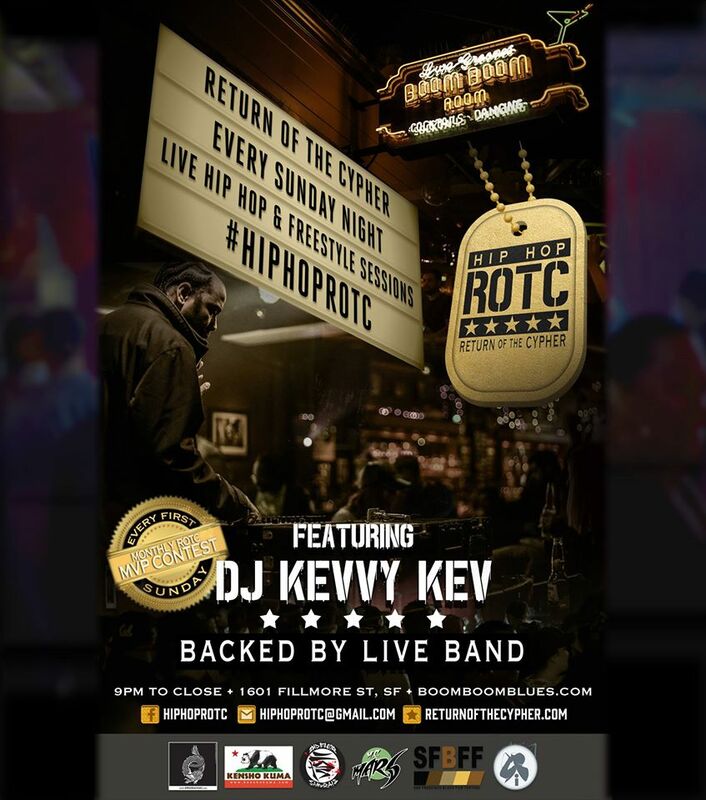 If you know me from real life, you already know that I am one of the directors for the weekly Return of the Cypher party @the Boom Boom Room in the historic Fillmore district in San Francisco. I am proud to report that our event recently celebrated our 5 year anniversary!! R.O.T.C. is an open-mic cypher accompanied by our in-house Get Down Band and legendary DJ Kevvy Kev. All emcees and vocalists are welcome to rock with us.. as long as they read the rules, acquire a wristband, and of course adhere to the guidelines stated in the rules. It is the most accurate representation of Hip Hop culture in the SF Bay Area.. and if you were raised by this culture, you will surely agree. Many of our patrons consider R.O.T.C. to be their temple/ mosques/ church , and religiously attend. Iconic legends that are in your iTunes right now regularly are in attendance. Large Professor, MC Akil of Jurassic 5, RZA, Killah Priest, Rappin’ 4-Tay, and Lyrics Born, have all stopped by and/or performed at R.O.T.C.!! Our event features a special performer doing a set every week. We have had touring acts from every imaginable region of the U.S., as well as international artists that ventured from Japan, Mongolia, Bali, Vietnam, U.K., and Sweden. We also feature the monthly M.V.P (Most Valuable Poet) contest, where competitors go after the coveted R.O.T.C. dog tags, a beatsmith live production set known as the Boom Boom Bap Session, and guest hosts with varying flavors. If you are a newbie emcee still mastering elementary skills, there doesn’t exist an environment more supportive than R.O.T.C. If you are a mid-tier flame spitter or veteran, our platform is the perfect place to try out new material, keep your bars sharp, and be reminded why you love rapping in the first place. If you are a veteran, please help us carry on tradition!! The essence of rap camaraderie is extremely powerful in our community; cats routinely cypher outside the venue after the party has ended.